This simple squash from the October/Halloween issue of Martha Stewart Living really called to me. Once in the kitchen, however, the instructions stymied. "4 delicata squashes, cut lengthwise into 1-inch-thick wedges, seeds discarded"
I puzzled. I pondered. What about the skin, shouldn't it be removed? And it's really difficult, dangerous even, to slice uncooked winter squash lengthwise: hard to get a grip, plus a knife can slip against the dense flesh and voila, there goes a finger. So I trusted Martha and left the skins on. But I trusted my knife instincts and sliced the squash in half, lengthwise, down the center. I scooped out the seeds and then cut one half into rainbow slices. For a test, I roasted the other half whole, filled with glaze. THE VERDICT The skins of delicata squash are definitely edible, though more skin-ish than many will appreciate. The hot pepper glaze is extraordinary. I would definitely roast delicata in the same rainbow slices again. I won't use the glaze in a half (whole ... how do you say that?) squash, the flavor just didn't permeate. 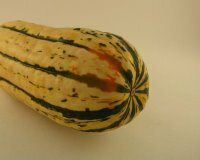 NUTRITION The magazine says one delicata squash serves two. In my book, it serves four, about seven of those rainbow rings per serving. FROM THE ARCHIVES For other recipes using winter squash, see here in the Recipe Box. Right now I'm longing for acorn squash with mustard and honey. Preheat oven to 375F. Slice off the stem and blossom ends of the squash. Cut lengthwise down the center. Scoop out the seeds and discard. Cut into half rings. Mix the glaze ingredients in a large bowl. Add the rings of squash and toss well until squash is coated with glaze. Transfer to a baking sheet (maybe cover it with foil for easy clean-up) and roast for 30 - 45 minutes, checking after 20 minutes or so, turning when the bottom sides have browned. I always leave the skin on when I cook delicata squash. My favorite way is to slice it crosswise into rings, remove the seeds, paint with some olive oil, sprinkle with salt and pepper, and grill them. The skin helps hold the rings together, and it really does soften enough to eat. And it looks beautiful, too! Jeff ~ It's pretty, yes? Lydia ~ Grilling would be terrific, yes. We don't see delicata so often in Missouri, however, so I haven't yet gotten to experiment much. That looks delicious! And the glaze sounds amazing! I'll have to try this sometime when I can get my hands on some pepper jelly! 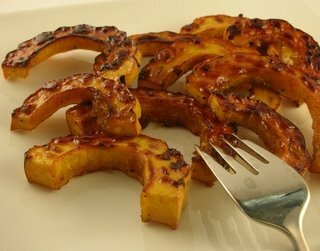 This is a delicious way to prepare Delicata squash. I just happened to have some pepper jelly that I didn't know what to do with. Voila! this recipe is excellent and easy. I shared it with a coworker and supplied the pepper jelly. She agreed that its a keeper. Thanks, Edith, to you (and your co-worker too) for taking the time to let me and other readers here know that you enjoyed it. Many thanks! !